Student Alumni Ambassadors work to enhance the student experience by providing opportunities to strengthen and build lifelong relationships to Elon as partners, advocates and investors. SAA facilitates interaction between students and alumni by creating relevant and meaningful programs for future alumni. 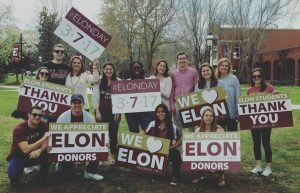 Underlying all that the Student Alumni Ambassadors do, is a belief in the importance of fostering lifelong participation and philanthropic support while maintaining Elon’s spirit and traditions. Ambassadors serve as official student representatives for the Office of Alumni Engagement and promote interaction among students, alumni, administrators, parents and friends of the university by providing support at events to various departments on campus. Plan events such as the First-Phoenix Tailgate, Uncorked Wine Tasting, Spirit Days/Nights, Life after Elon Series, Dinner with the Phoenix, Elon Day etc. Interested in becoming a Student Alumni Ambassador? You can also find the Elon Student Alumni ambassadors on Facebook.